Greens Fees: $175 to walk, plus $20 per person for forecaddie, plus recommended tip of $25. 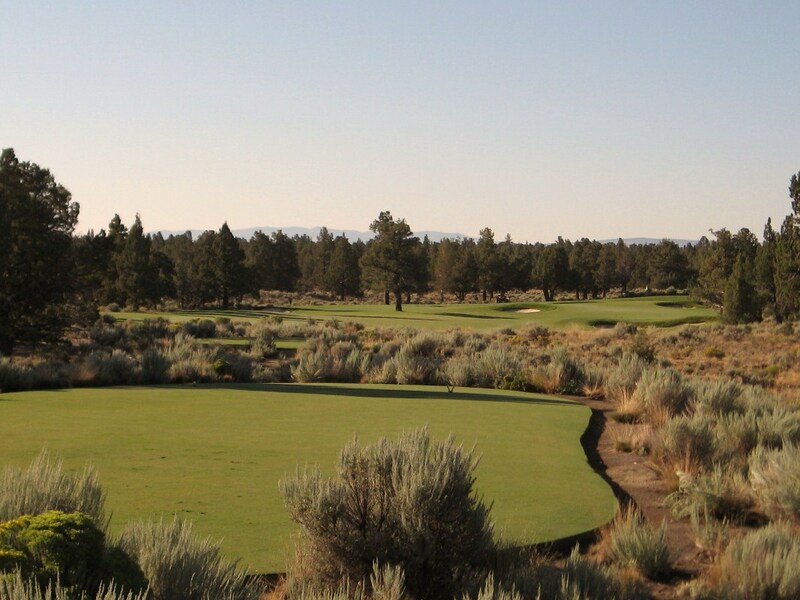 The Pronghorn Club in Bend, OR consistently ranks as one of the premier golf communities in the country, and for good reason. 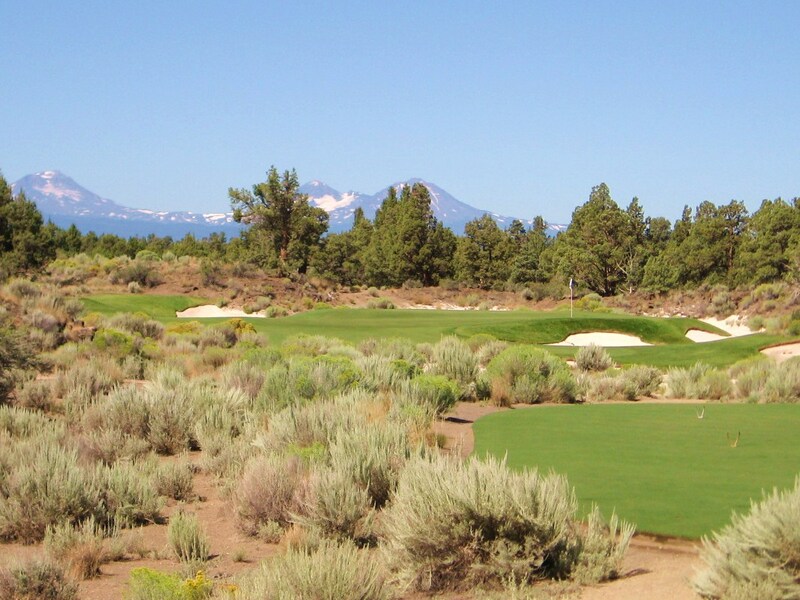 The Nicklaus and Fazio courses provide members with two beautifully maintained and challenging courses in a spectacular setting that is the high desert of Central Oregon. 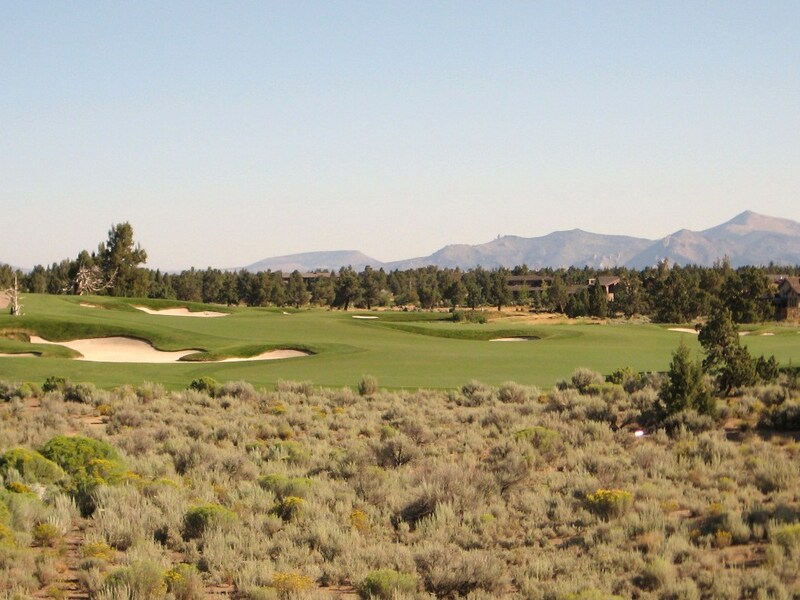 Fortunately for those of us who cannot live at Pronghorn, the Nicklaus course has been opened to the public so we can experience a great round of golf on a course that is enjoyable to walk. 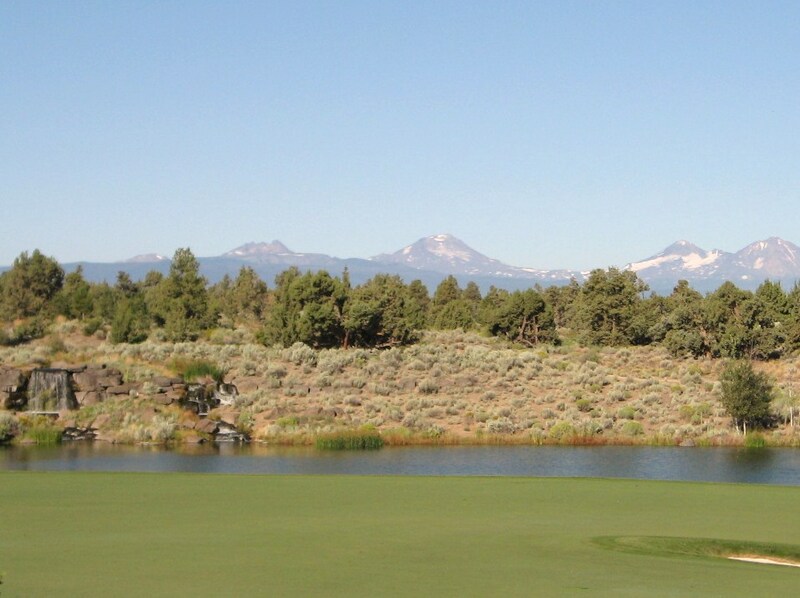 View from 7th Tee across the 13th fairway to the three Sisters, Broken Top and Mt. Bachelor in the distance. 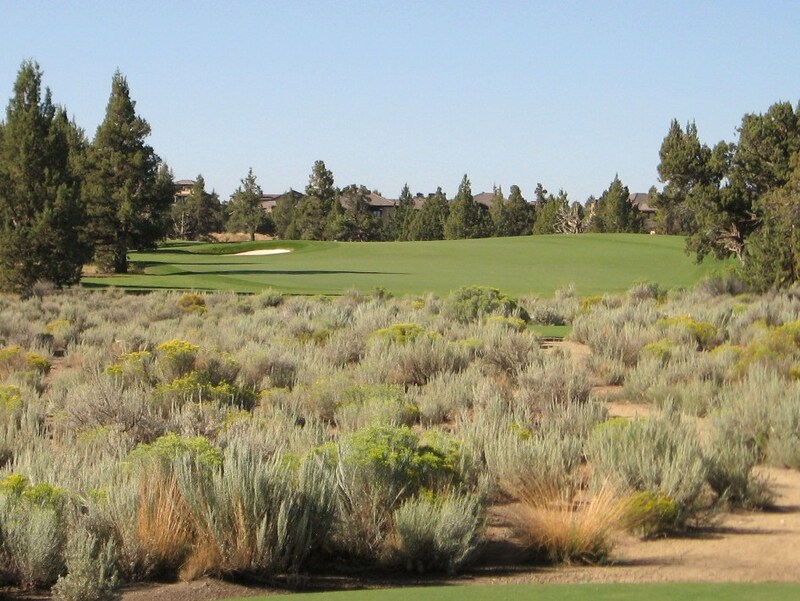 Most golf communities provide their members and guests with either a tough walk or “cart golf”. 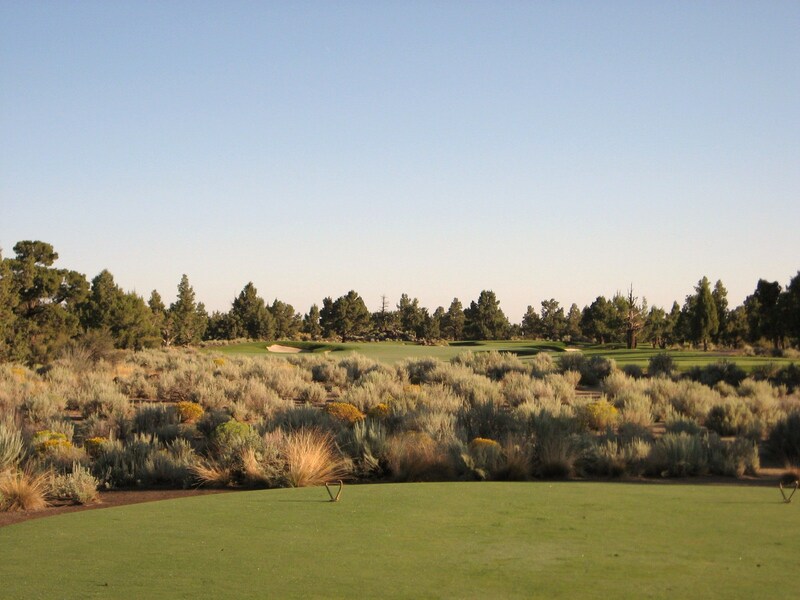 However, the courses at Pronghorn are fairly easy to walk because the club and architects worked to ensure that both tracks had fairly short green to tee transfers and paths from tees to fairways through the high desert. 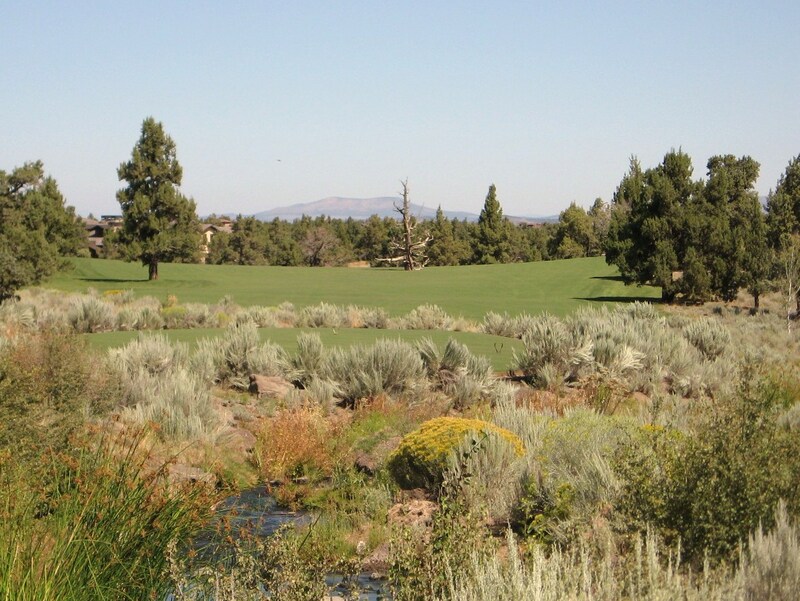 The site at Pronghorn is also relatively flat, with some rolling terrain that is very manageable for walkers. 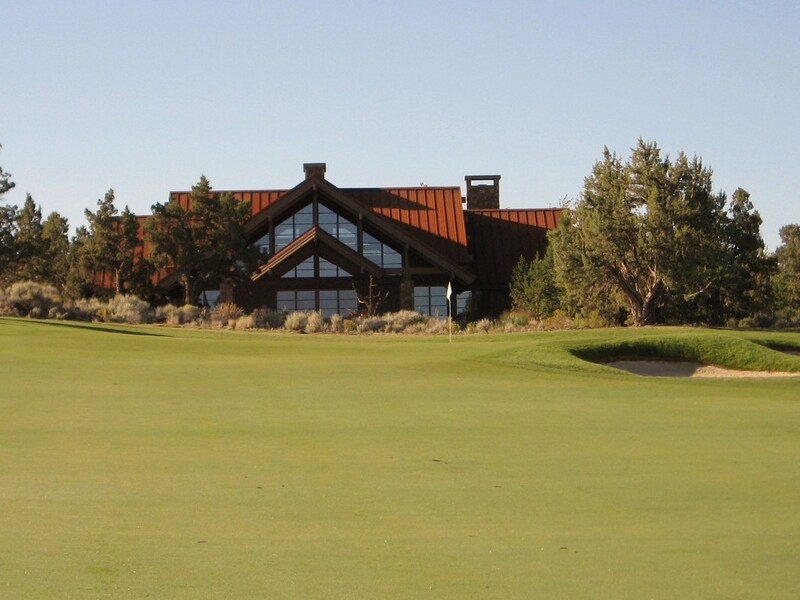 Unfortunately, only a small percentage of golfers ever walk at Pronghorn. The pictures that follow cannot do justice to the beautiful scenery, nor the impeccable care that is given to the course by the staff. 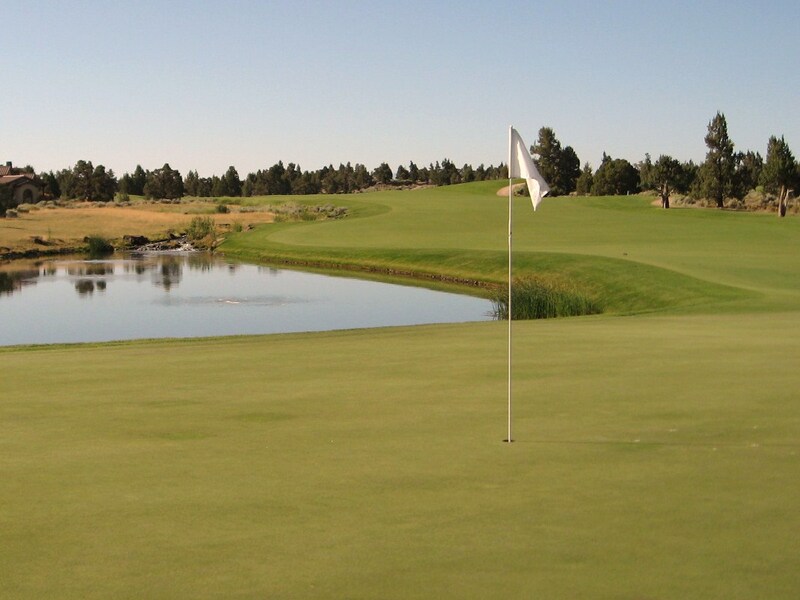 The fairways at Pronghorn are like greens at other courses and the putting surfaces are fit for a major championship each and every day. Pronghorn-Nicklaus is the best maintained course I have ever played and it must cost a fortune to keep it in such good shape. The first is a nice opening hole. Just drive it out towards the right hand bunker to give yourself a good line into the green. Bunkers are visible to the left and right of the green, with another tucked back right out of sight. 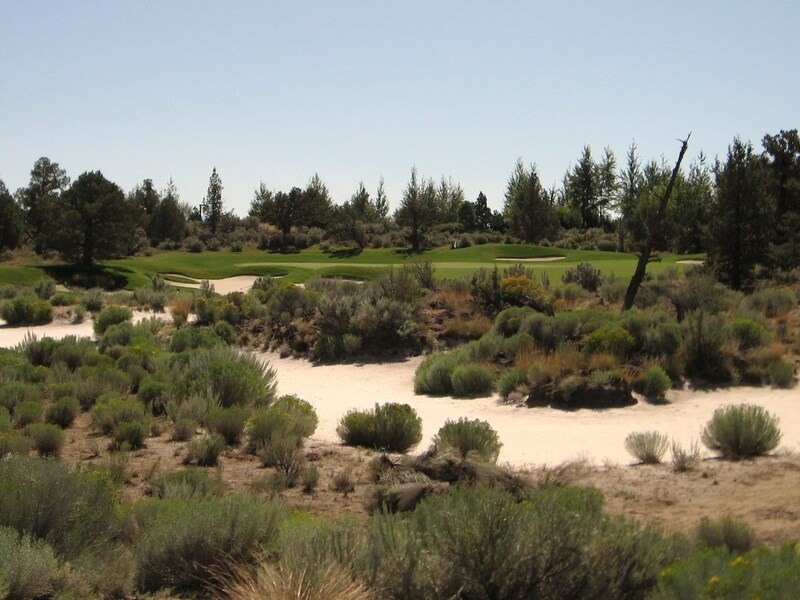 Notice how the native vegetation and rocks have been incorporated into the presentation of the left bunker, this is a recurring theme throughout the round that adds nicely to the course aesthetics. Approach to the 1st Green at Pronghorn-Nicklaus. Even with the morning dew covering the fairway, it is evident how the fairway melds very nicely into the green which is stimping around twelve or thirteen. 1st hole at Pronghorn-Nicklaus looking back. A fade off the fairway bunker in the distance is the optimal line to set up a long iron and then wedge into the green. 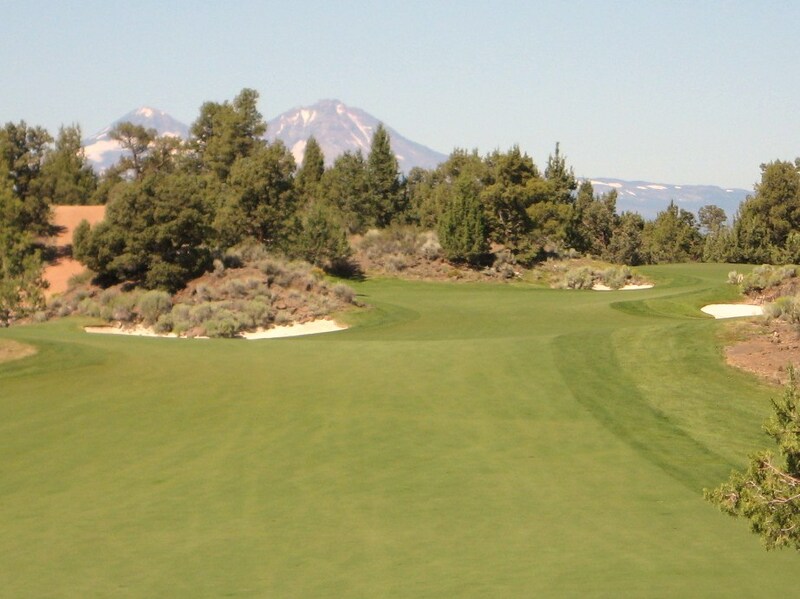 At over 570 yards from the tips, it will take a huge power fade off the tee, followed by a high draw into the green for any hope of an eagle putt. Since this is a Nicklaus design, you know that precise ball placement off the tee and into specific areas of the greens is necessary for scoring success. A couple of tall trees in the left hand rough, along with the bunker guarding the front of the green, make a second to the green a real challenge. The wise play is to lay up about one hundred yards short, on the right side of the fairway, which will provide you with the short approach pictured below. Approach to the 2nd Green at Pronghorn-Nicklaus. The third is basically a par three and a half, especially from the back tee. For most golfers this will be driver or fairway wood. A tee shot landing in the gaping right side bunker will leave a long blast out to the green, while a miss into the left greenside bunker is more manageable. 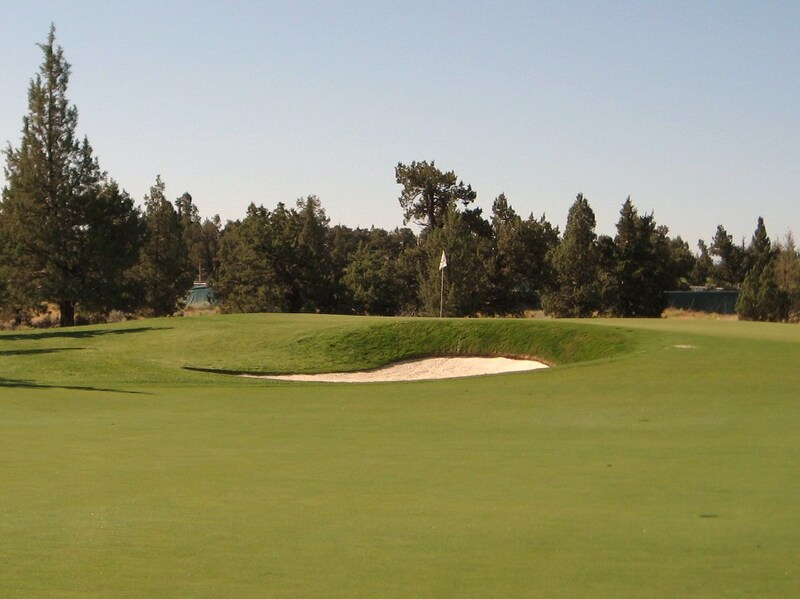 There is a large area behind the short bunker, to the right of the putting surface, that provides a good bail out. Shots landing in this tightly mown area can be run down towards the hole. After the long one shot third, there is an opportunity to get a stroke back on the short two shot fourth. 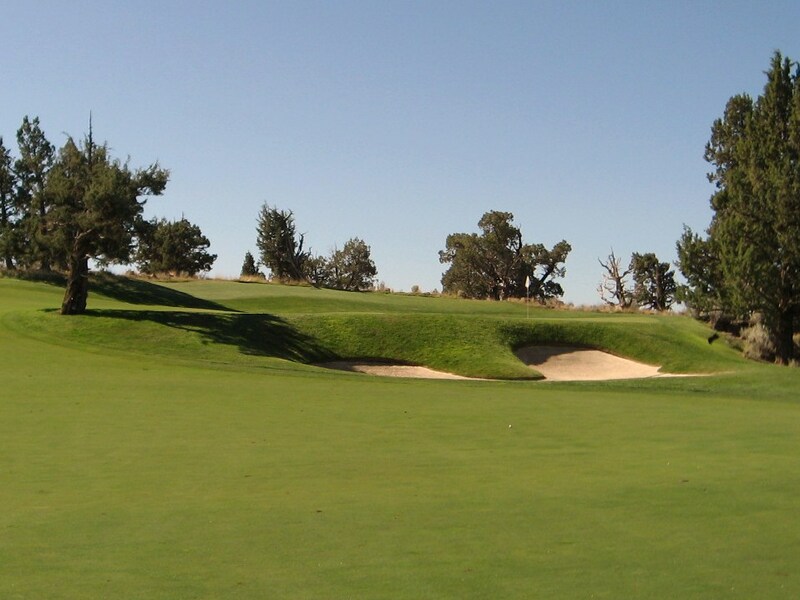 The lone tree and bunker positioned in the fairway are anywhere from 180 to 280 depending on the tees you are playing, so be careful on club selection. The smart play is probably to hit a long iron or fairway wood to your favorite wedge distance. The tee pads at Pronghorn, as pictured below, are pretty cool and quite original. The green is slightly raised and protected by two bunkers, but your short wedge should have eyes for the pin leaving a great look at birdie. Approach to 4th Hole at Pronghorn-Nicklaus. If you ate your morning Wheaties then you may be able to get to the green in two on this uphill par four. Keep your drive to the right side of the fairway bunker for a long iron or fairway wood to the green about 200 yards away. The saddle shaped green has a false-front, but there is room to run your ball up on the left side if you can get a lucky bounce forward. 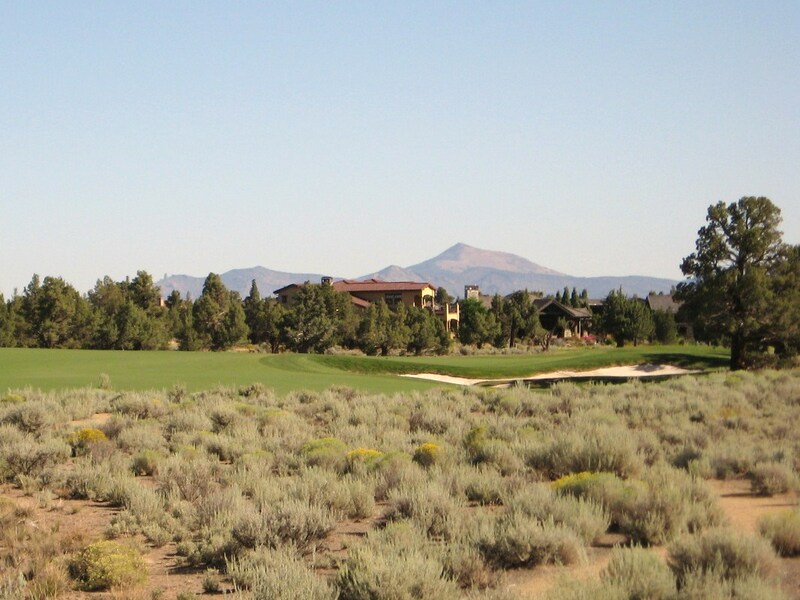 That is not the clubhouse behind the green, just one of the amazing homes that can be found on the property at Pronghorn. Short of 5th Green at Pronghorn-Nicklaus. 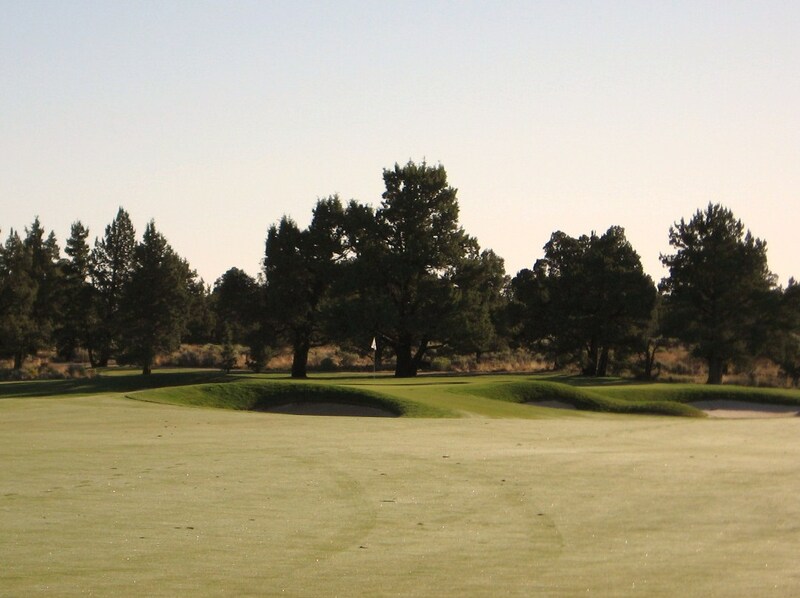 The sixth is another long par four that will test your driver and long iron skills. The bunker, or just right of it, is a good aiming point about 345 yards from the tips. A well struck mid to long iron that gets over the hump about twenty yards short of the green will get a nice roll down onto the putting surface that sits in a bowl. Approach to 6th Green at Pronghorn-Nicklaus. The one shot seventh looks easier in the photo than it plays. There is a steep false-front protecting the green, which is perched on top of a little hill, so anything short will leave a challenging uphill pitch from the tightly mown grass. The putting surface is thirty-three yards deep and runs from back left to front right and it is very fast. The eighth is a fairly long three shotter with marsh and water running up the right side for the final three hundred yards. 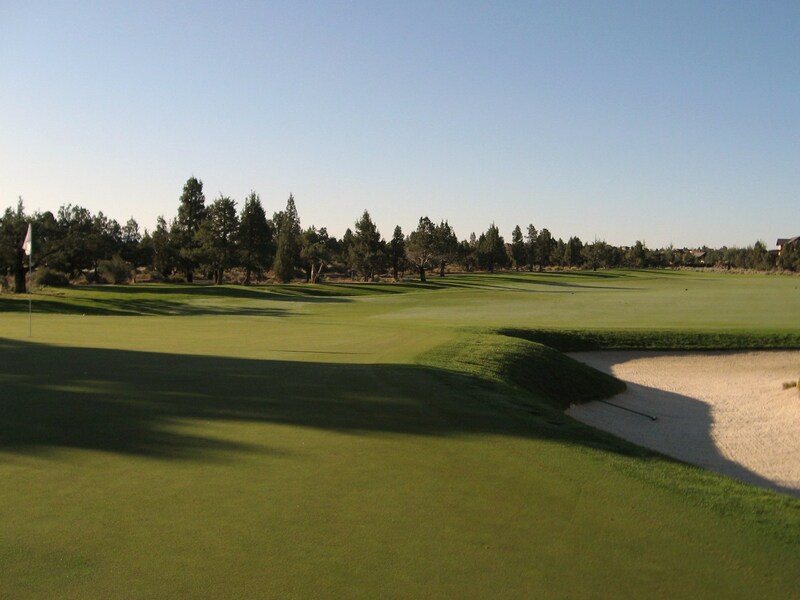 A drive must fly 270 yards from the back pad to carry the bunker in the middle of the fairway. 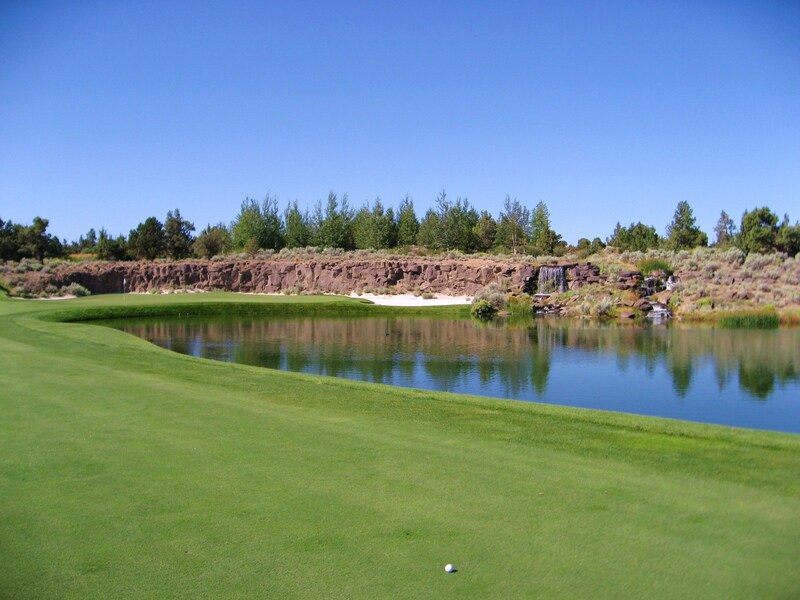 The green is protected by water so a lay up to your preferred wedge distance is, as is often the case at Pronghorn-Nicklaus, a good idea. The hourglass green is protected on both sides by sand and water is waiting for anything really short. 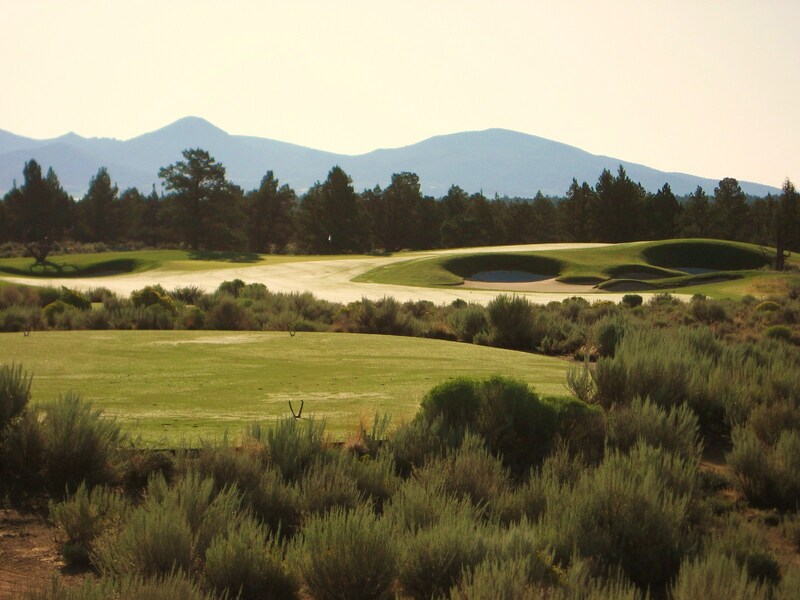 Approach to the 8th Green at Pronghorn-Nicklaus. Looking back, it is evident that the eighth is a solid three shotter where par is well earned. Looking back from the 8th Green at Pronghorn-Nicklaus. The optimal line off the tee is just over the right edge of the fairway bunker on the left side which is, once again, about 270 from the tips. The hole doglegs slightly to the left where a raised shallow green awaits the approach. Distance control is vital to keep the ball on the putting surface and out of the front bunker or the collection area in the back. Short of the 9th Green at Pronghorn-Nicklaus. There is a lot of room off the tee on the tenth so just rip it at the red roof in the distance. The green complex is challenging because the bunker is ten yards short of a putting surface that is raised and surrounded by short grass. Once again, an exact approach is required for a good chance at birdie. Approach to the 10th Green at Pronghorn-Nicklaus. 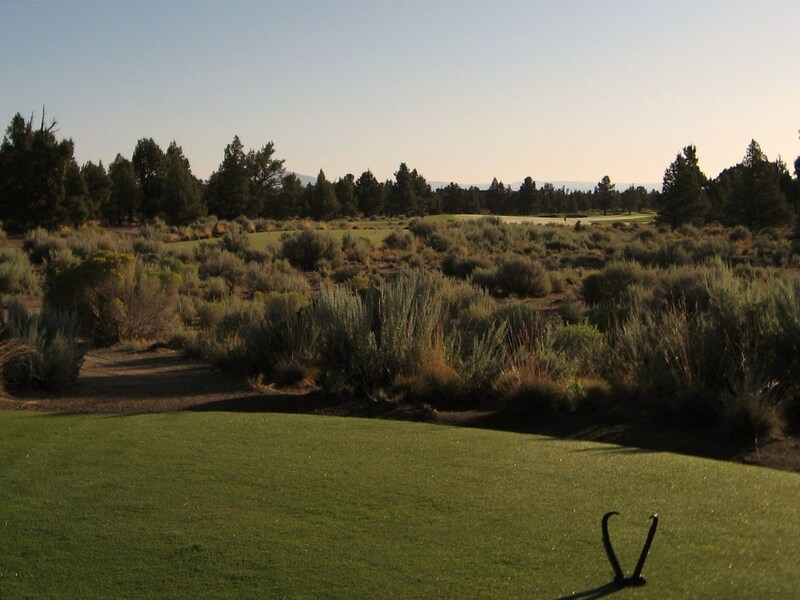 The round really starts to get fun at the eleventh which kicks off a stretch of holes that can easily give up a birdie or punish the golfer with a big number if you stray from the ideal line. The fairway bunker with the tree in the middle is about 285 yards from the back tee, but there is room to go right or left if you cannot get over it. 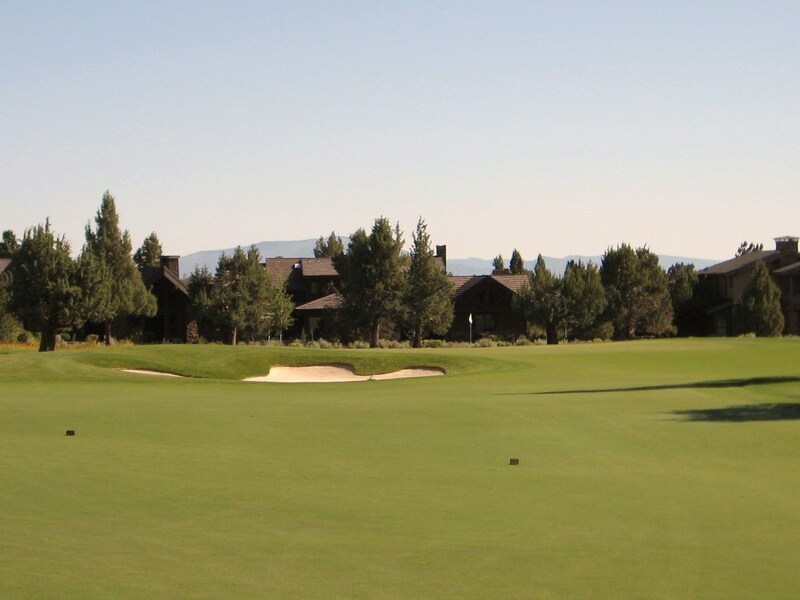 The green is thirty yards long and protected along the left side with a masterfully landscaped bunker and on the front right by another bunker that is deeper. The approach should be with a short to mid-iron aimed at the center or left side of the green. 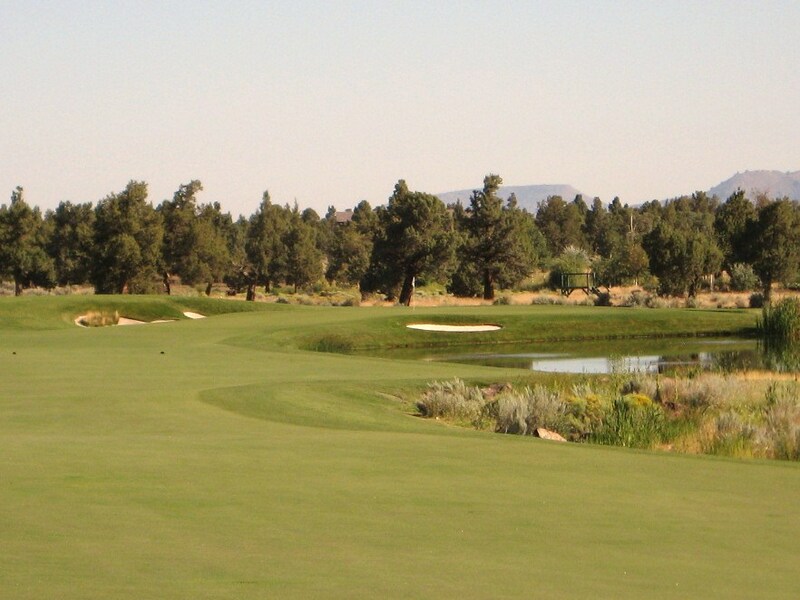 Approach to the 11th Green at Pronghorn-Nicklaus. The bunker that runs along the right side of the fairway exemplifies the care that the architect and maintenance team put into the design and upkeep of the course. 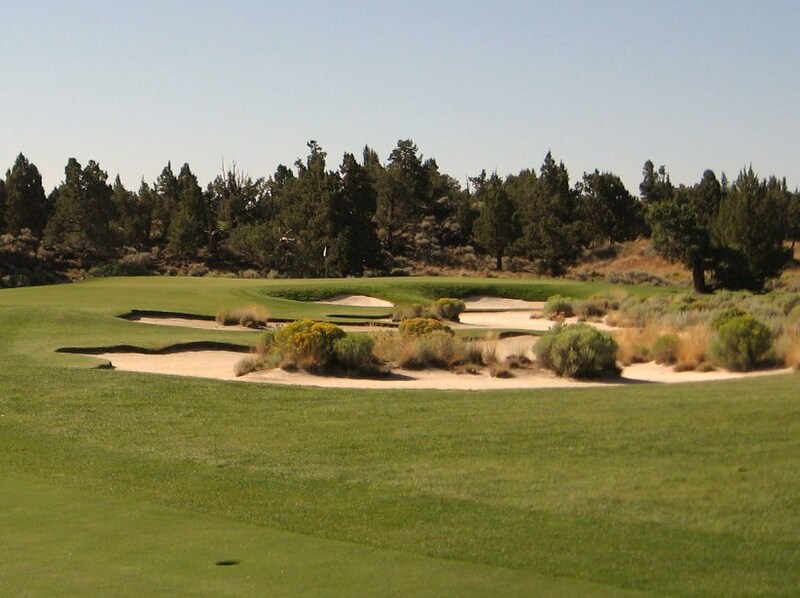 The native vegetation seems to flow out of the high desert into the nicely sculpted bunker which adds a wonderful flair to the hole. Fairway bunker on the 11th hole at Pronghorn-Nicklaus. This short par four could be drivable with a tail wind although stopping the ball on the green with a driver would be no easy task. The landing area looks very small from the tee but it is about fifty yards in length and width. A fairway wood or hybrid off the tee will leave a tricky approach of twenty-five to seventy-five yards. The hill behind the green can act as a backboard for anything over-hit, but to get it close it is important to land your pitch just over the bunkers and onto the putting surface as the green is only twenty-one yards deep. 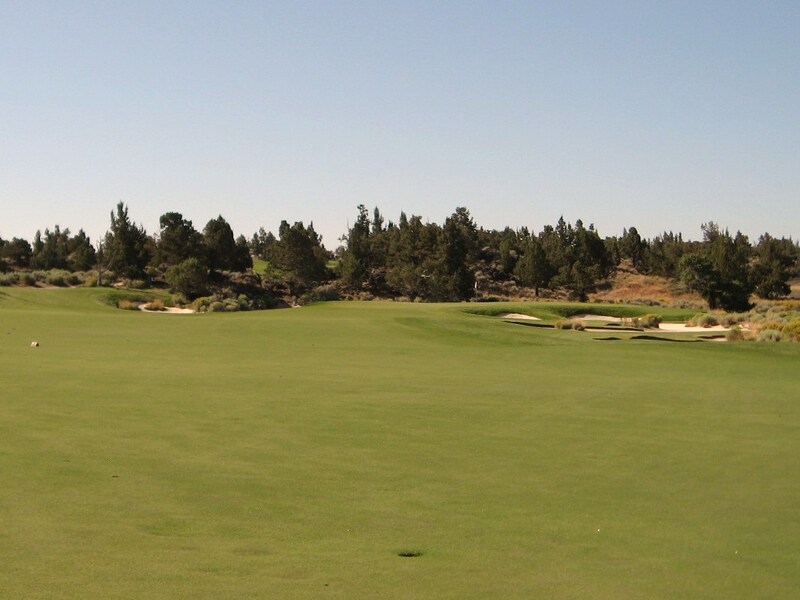 Approach to the 12th Green at Pronghorn-Nicklaus. Looking back to the tee it is obvious how large the landing area really is, a nice bit of deception by the architect. The view from green to tee is striking and worth a moment to take it in before moving on to another fun but challenging hole in the thirteenth. Looking back down the 12th from the Green at Pronghorn-Nicklaus. The short two shot thirteenth is a good strategic hole that wraps around a lake which is fed by a waterfall next to the green. With a fairway wood or hybrid, the bunker in the middle of the fairway is a good target that will provide a wedge to the green. The tiger golfer may want to play driver to leave a short pitch to the putting surface, but is the risk worth the reward? With a strong tailwind, the green may be drivable from the forward tees. The green is located just in front of a ridge of rock, with a bunker behind the putting surface providing a few yards of separation. On a hot day, the waterfall can look very inviting. 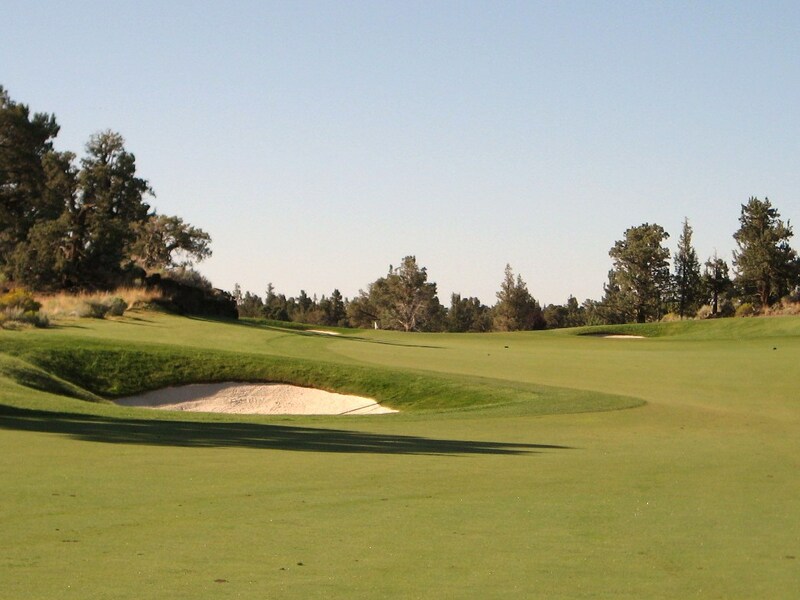 Approach to the 13th Green at Pronghorn-Nicklaus. The putting surface slopes from back to front so a juiced half wedge is often the shot of choice to spin it close to the hole. Close-up of 13th Green at Pronghorn-Nicklaus. 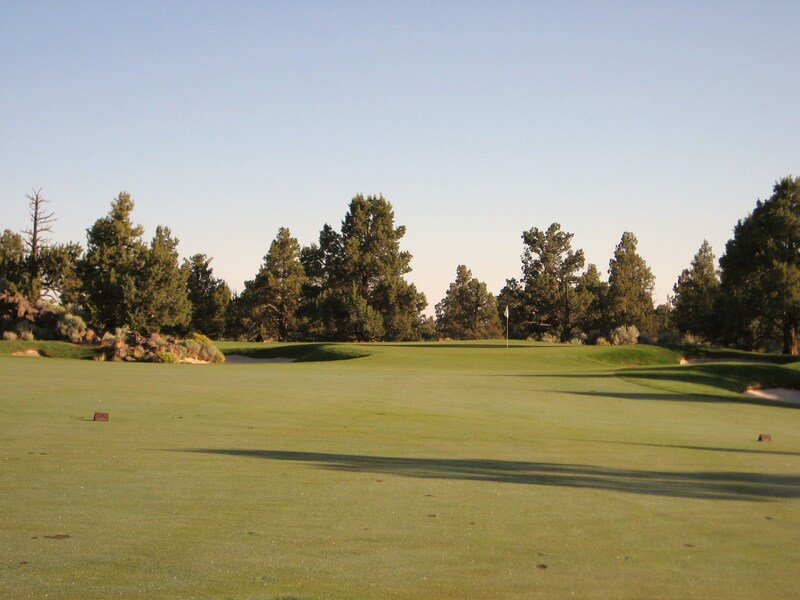 Holes fourteen through seventeen are a short walk from the others on the back nine and are accessed by a tunnel that runs under Pronghorn Club Drive. 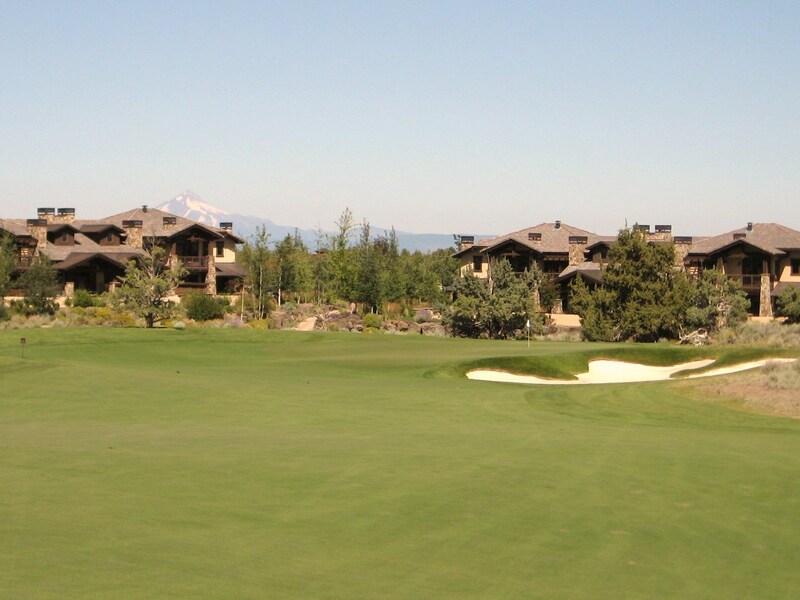 The one shot fourteenth is a definite “wow” hole that provides breathtaking views of the Cascade mountains in the distance. A long bunker runs around the green from short right to the back left. 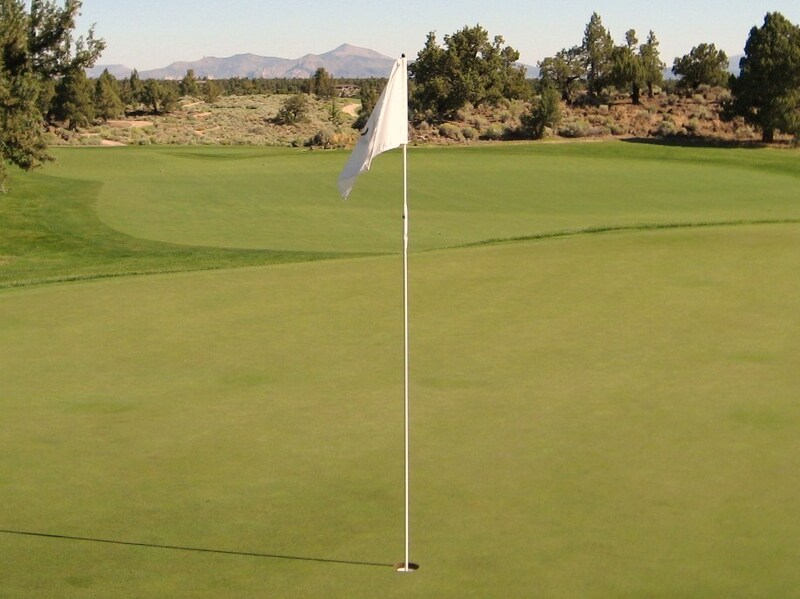 The putting surface is elevated on three sides but the front left is open for a bailout. The fifteenth and sixteenth are back to back par fives and both run beautifully through the natural landscape from tee to green. On fifteen, a long drive over the bunker and waste area on the right side of the fairway will get a kick forward that could put a big hitter in position to go for the green in two. The fairway is quite narrow as the architect disturbed as little of the natural environment as possible when laying down the hole. The serpentine fairway undulates all the way to the green. The challenge of the hole is complemented once again by an awesome vista of the mountains in the distance. Sixteen is another serpentine three shotter that flows naturally across the high desert while offering an abundance of challenge. A big drive over the left side fairway bunker will get a turbo boost off the speed slot on the other side leaving about 235 yards to a green which is hidden from view. As the golfer rounds the corner about one hundred yards from the green, it finally comes into view. The tree on the left can stymie a lay up that runs too far and the bunker fronting the green adds difficulty to the approach. The large bunker in the photo below will gobble up any second shots that try to fade around the corner but run out of gas. The wise golfer will likely play this hole as a true three shotter and lay up about 110 yards short of the green to leave this approach to the pin. Approach to the 16th Green at Pronghorn-Nicklaus. The seventeenth has an intimidating bunker covered with native vegetation that will feast on any tee shots that end up well short of the fairway. A large bunker protects the left side of the green and two smaller bunkers lurk at the back. The putting surface runs at an angle from back left to front right which adds to the challenge of proper club selection depending on pin position. 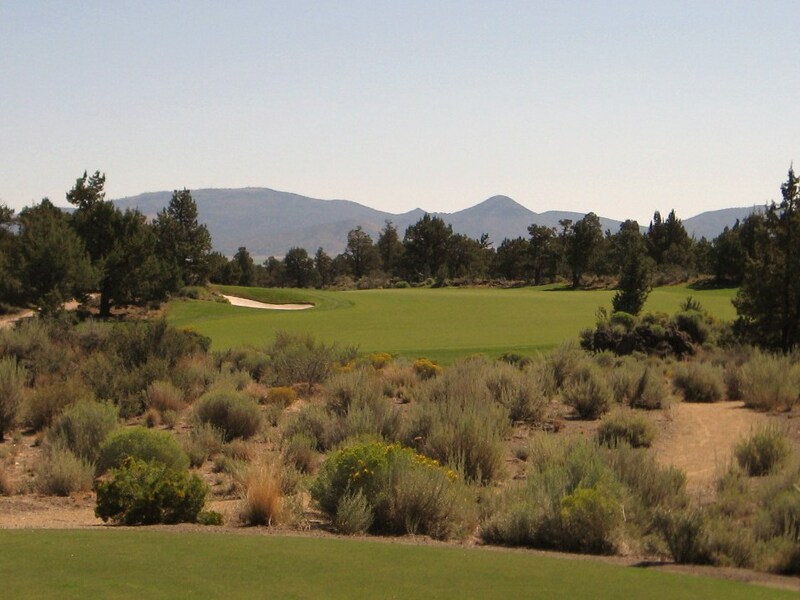 The golfer walks back through the tunnel to get to eighteen which is a fairly long two shotter that flows up and over a rise to a deep and difficult green. The putting surface has some undulation as it slopes generally from back to front. A large bunker guards the right side and a chipping area lies to the left. The approach is often from a slightly downhill or sidehill lie which adds to the challenge of this solid finishing hole. 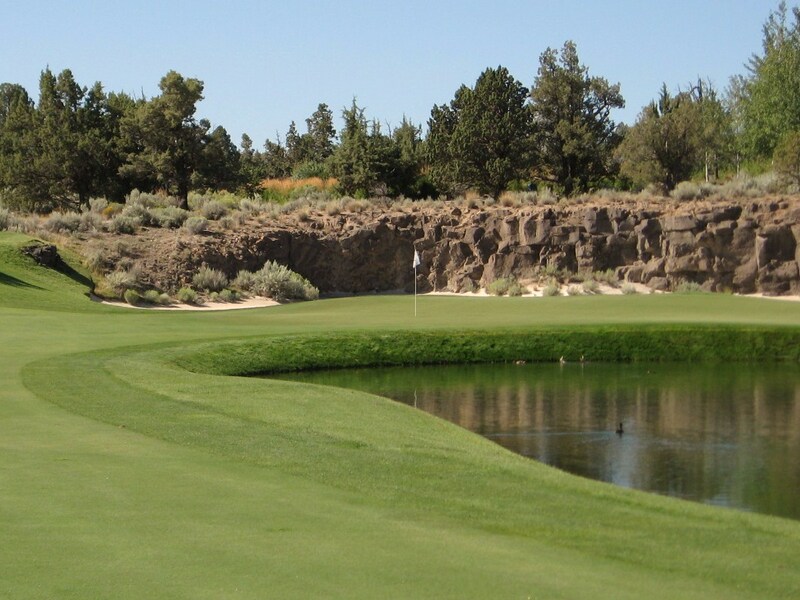 Approach to the 18th at Pronghorn-Nicklaus. A walk across the parking lot and past the driving range will get you back to the clubhouse for a well deserved beverage. 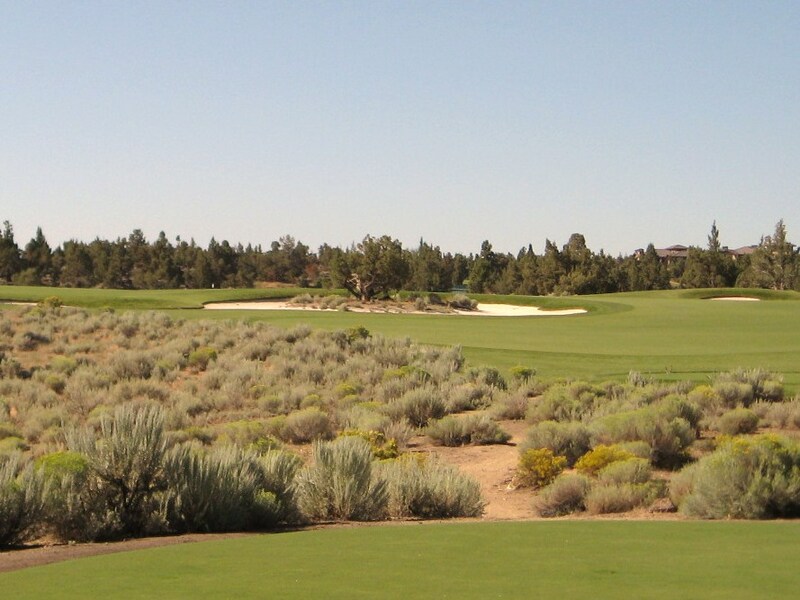 Pronghorn-Nicklaus is a solid golf course that is very manageable to walk. At over $200 per golfer it is a very expensive outing. Making Juniper at less than $65 and Tetherow at $175 for two rounds much better values. In terms of Walkability, I would rate Pronghorn-Nicklaus a 3.0 out of 4. 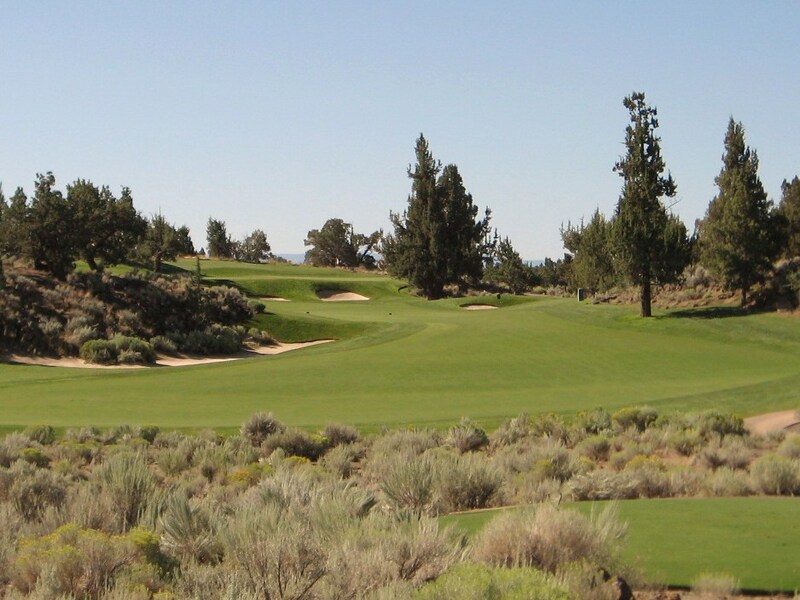 The walk from tees to fairways have been nicely cut through the high desert and are marked by a gravel path that blends seamlessly with the landscape, but there are a few green to tee transfers that prevent me from giving the course a higher rating in this category. 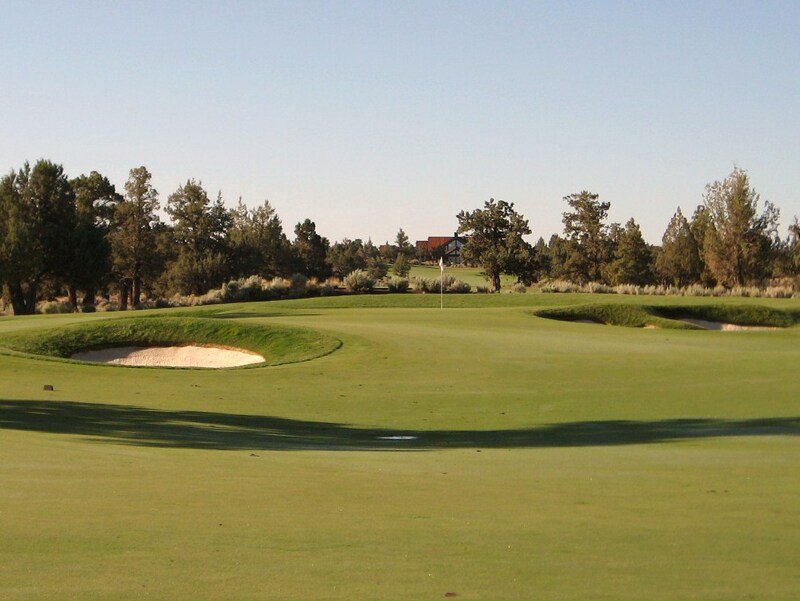 For courses that must be routed with a residential community in mind, Pronghorn-Nicklaus is a case study in how to do it properly. 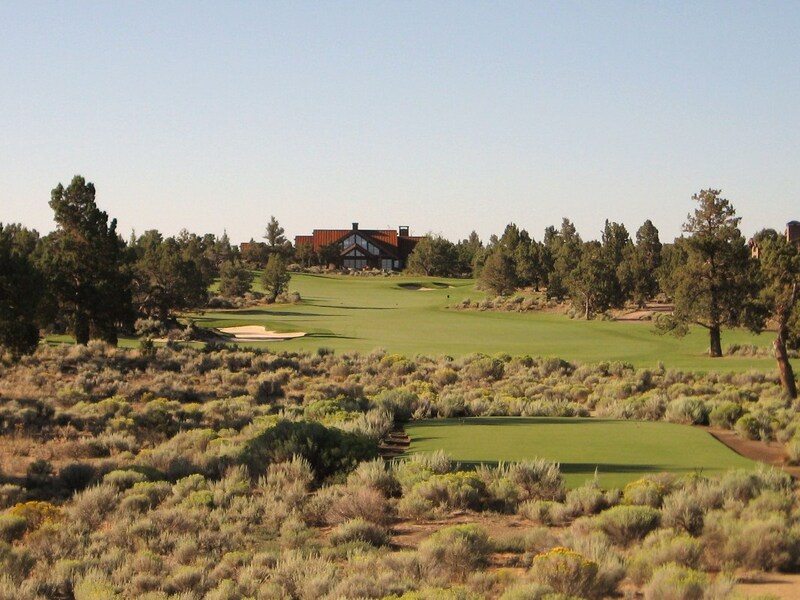 For Architecture and Aesthetics, Pronghorn-Nicklaus receives 3.0 out of 4. 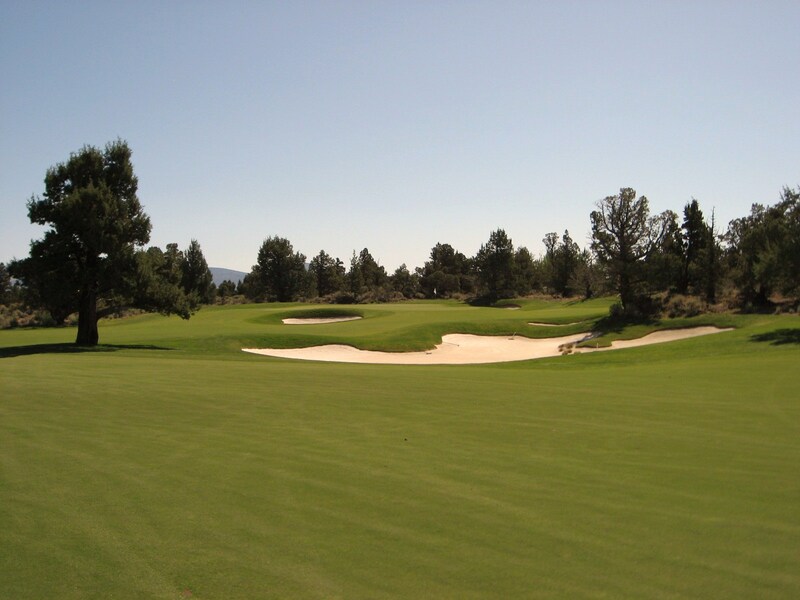 Aesthetically, the course is phenomenal as it blends nicely with the environment and is impeccably maintained. Architecturally, the course is interesting enough and provides a range of challenges with the back to back par five 15th and 16th the hi-lites. 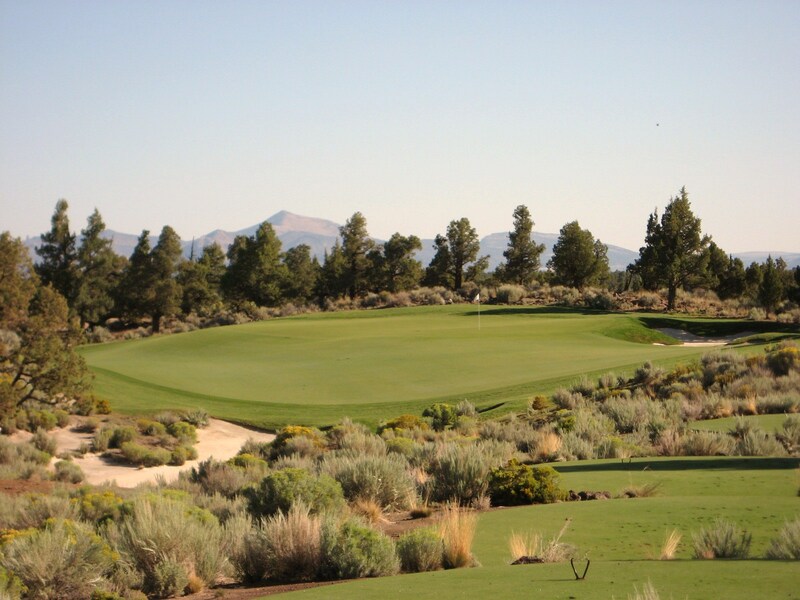 Pronghorn-Nicklaus receives 1.5 out of 2.0 for Strategy and Playability as the course is fair but challenging. To score well, the golfer must tactfully navigate around the course hitting targets as appropriate. 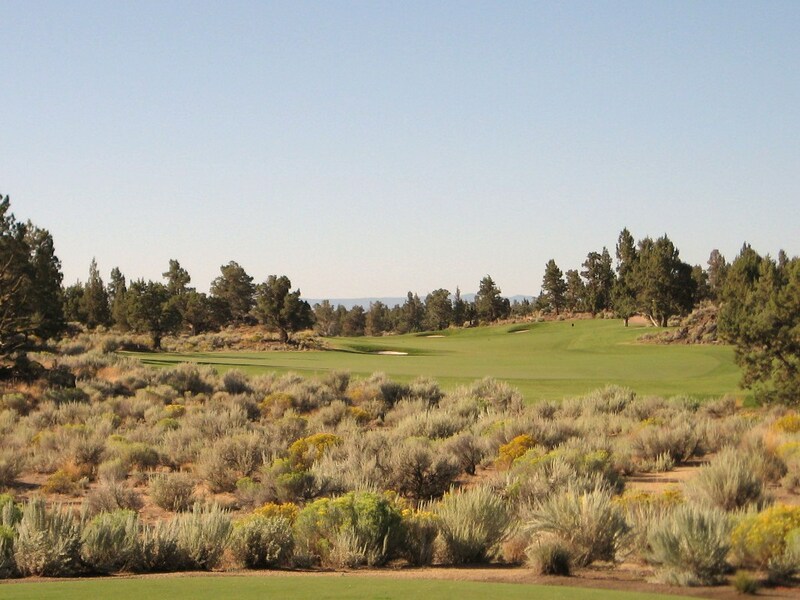 However, for bogey golfers or women who do not hit the ball a long way off the tee, Pronghorn-Nicklaus is very playable and easy to enjoy. 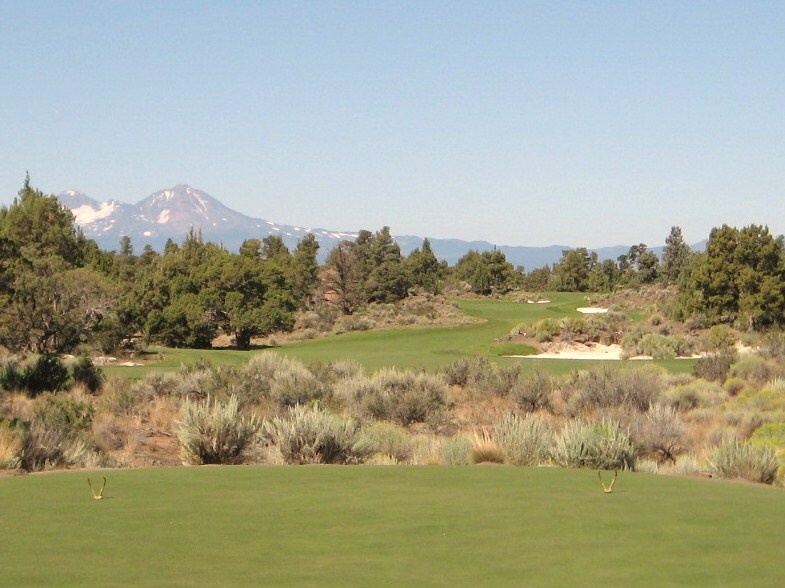 It strikes a good balance between playability and difficulty which many courses fail to do. 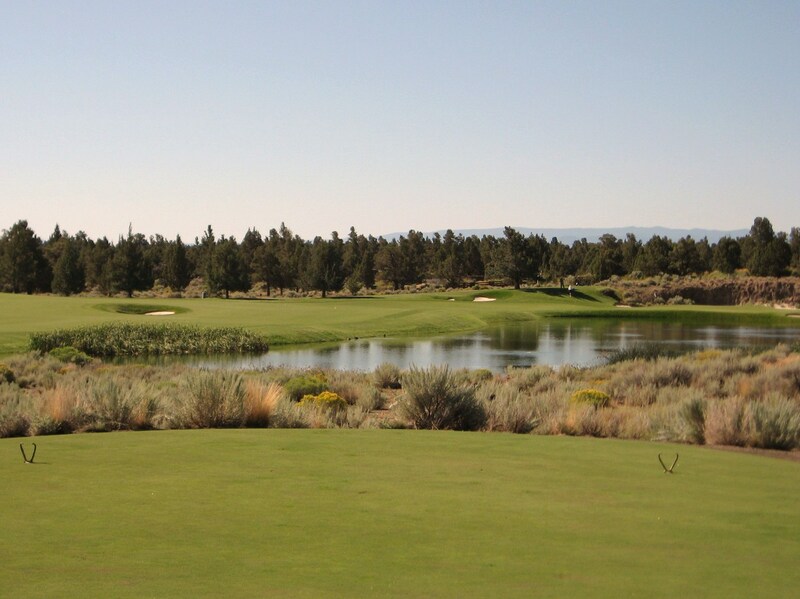 Overall, Pronghorn-Nicklaus receives a 7.5 out of 10 from The Walking Golfer.